The year 2017 marks the 50th anniversary of the home microwave oven. The ovens were first sold for home use by Amana corporation in 1967, but they had actually been used for commercial food preparation since the 1950s. 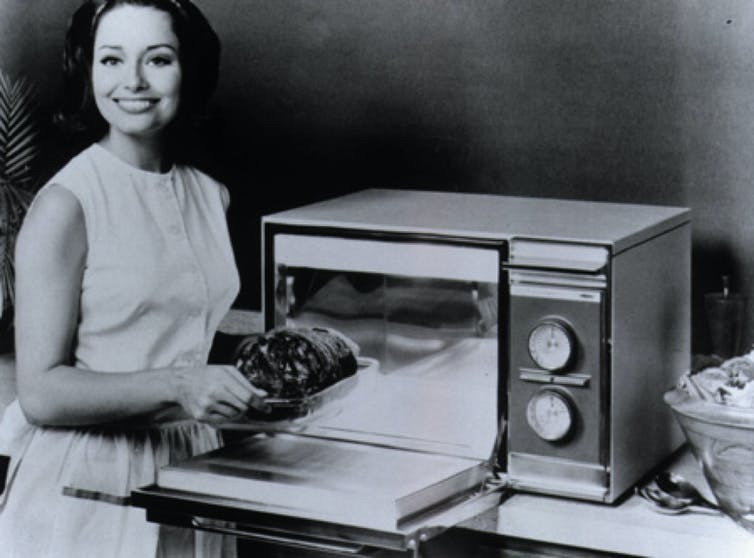 It wasn’t until 1967, however, that technology miniaturization and cost reductions in manufacturing made the ovens small enough and cheap enough (a still steep US$495; US$3,575 in 2017 dollars) for use in the kitchens of the American middle class. Now, it would be hard to find a U.S. home without a microwave. It will be quick and it will be hot. Amana, a subsidiary of Raytheon corporation, actually called their first model the “Radarange” – a contraction of radar and range (as in stove). What do microwave ovens have to do with radar? Radar is an acronym for “radio detection and ranging.” Developed prior to World War II, the technology is based on the principle that radio waves can bounce off the surfaces of large objects. So if you point a radio wave beam in a certain direction, some of the radio waves will come bouncing back to you, if they encounter an obstruction in their path. By measuring the bounced-back radio waves, distant objects or objects hidden from view by clouds or fog can be detected. Radar can detect planes and ships, but early on it was also found that rainstorms caused interference with radar detection. It wasn’t long before the presence of such interference was actually utilized to track the movement of rainstorms across the landscape, and the age of modern radar-based weather forecasting began. 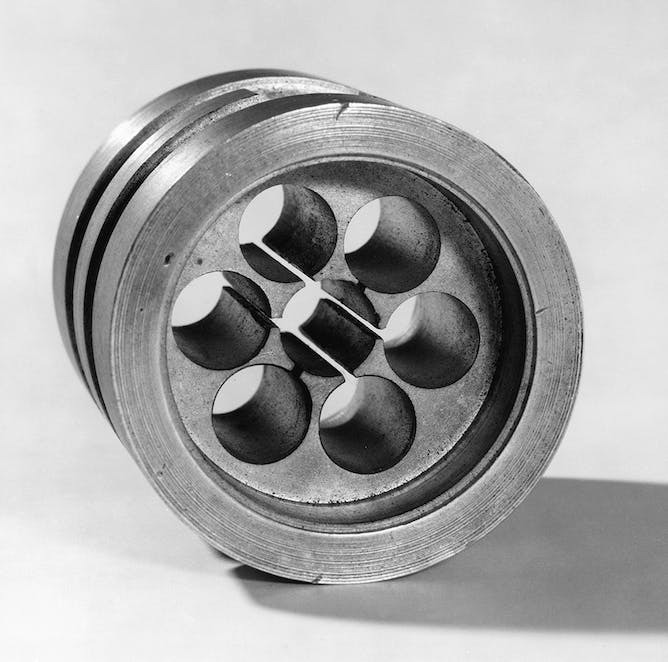 Original cavity magnetron as used to develop radar. At the heart of radar technology is the “magnetron,” the device that produces the radio waves. During World War II, the American military couldn’t get enough magnetrons to satisfy their radar needs. So Percy Spencer, an engineer at Raytheon, was tasked with ramping up magnetron production. He soon redesigned the magnetron so that its components could be punched out from sheet metal – like sugar cookies are cut from dough – rather than each part needing to be individually machined. 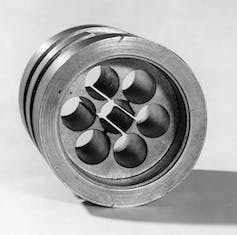 This allowed mass production of magnetrons, raising wartime production from just 17 to 2,600 per day. One day, while Spencer was working with a live magnetron, he noticed that a candy bar in his pocket had started to melt. Suspecting that the radio waves from the magnetron were the cause, he decided to try an experiment with an egg. He took a raw egg and pointed the radar beam at it. The egg exploded from rapid heating. Another experiment with corn kernels showed that radio waves could quickly make popcorn. This was a remarkably lucky find. Raytheon soon filed for a patent on the use of radar technology for cooking, and the Radarange was born. Amana Radarange commercial from 1976. As time passed and other companies got into the business, the trademarked Radarange gave way to more generic terminology and people started calling them “microwave ovens,” or even just “microwaves.” Why microwaves? Because the radio waves that are used for cooking have relatively short wavelengths. While the radio waves used for telecommunications can be as long as a football field, the ovens rely on radio waves with wavelengths measured in inches (or centimeters); so they are considered “micro” (Latin for small), as far as radio waves go. Microwaves are able to heat food but not the paper plate holding it because the frequency of the microwaves is set such that they specifically agitate water molecules, causing them to vibrate rapidly. It is this vibration that causes the heat production. No water, no heat. So objects that don’t contain water, like a paper plate or ceramic dish, are not heated by microwaves. All the heating takes place in the food itself, not its container. Microwaves have never completely replaced conventional ovens, despite their rapid speed of cooking, nor will they ever. Fast heating is not useful for certain types of cooking like bread-baking, where slow heating is required for the yeast to make the dough rise; and a microwaved steak is no taste match for a broiled one. Nevertheless, as the fast-paced American lifestyle becomes increasingly dependent upon processed foods, reheating is sometimes the only “cooking” that’s required to make a meal. Microwave ovens’ uniform and rapid heating make them ideal for this purpose. Over the years, there have been many myths associated with microwave cooking. But the truth is that, no, they don’t destroy the food’s nutrients. And, as I explain in my book “Strange Glow: The Story of Radiation,” you don’t get cancer from either cooking with a microwave oven or eating microwaved food. In fact, the leakage standards for modern microwave ovens are so stringent that your candy bar is safe from melting, even if you tape it to the outside of the oven’s door. What’s the deal with metal in the microwave? Nevertheless, you should be careful about microwaving food in plastic containers, because some chemicals from the plastic can leach into the food. And, yes, you shouldn’t put any metal in the microwave, because metallic objects with pointed edges can interact with the microwaves from the magnetron in a way that can cause electrical sparking (arcing) and consequently damage the oven or cause a fire. The microwave oven has definitely transformed the way most of us cook. So let’s all celebrate the 50th anniversary of the home microwave and the many hours of kitchen drudgery it has saved us from. But if you want to mark the date with an anniversary cake, best not to cook it in your microwave – you’d likely end up with just a very hot and unappetizing bowl of sweet mush. Publisher's note: This article was originally published on Examiner.com on March 19, 2011. The Examiner.com publishing platform was discontinued July 1, 2016, and its web site went dark on or about July 10, 2016. I am republishing this piece in an effort to preserve it and all my other contributions to Examiner.com since April 6, 2010. It is reposted here without most of the internal links that were in the original. Sponsored by the Charlottesville-based Virginia Foundation for the Humanities (VFH), the annual Virginia Festival of the Book brings about 25,000 visitors to the city to hear and engage with authors, publishers, book reviewers, and bibliophiles. The 2010 festival hosted 160 events featuring 307 authors, drawing visitors from 35 states and at least six foreign countries. Vaughan spoke to the Charlottesville Libertarian Examiner at the University of Virginia on March 16, after a presentation on civility in public life by former Iowa congressman Jim Leach, who now serves as chairman of the National Endowment for the Humanities. Over the next year, Vaughan said, the VFH will continue its traditional programming activities but it is also branching out. VFH , he added, has recently begun to include Virginia’s Native Americans in its programs. VFH is also involved in efforts to commemorate the 150th anniversary of the American Civil War, which began in April 1861. “We have been involved with the Virginia Sesquicentennial [of the American Civil War] Commission,” he said, helping “in a minor way” with the seven conferences the commission is putting on. “There have been two so far. The next one will be on May 21st at Virginia Tech, focusing on military" issues. A larger project that he described is “building an encyclopedia of Virginia, an entirely on-line, digital publication,” which has been in process for about four years. “It takes a long time because it is gigantic, as you might imagine,” Vaughan explained. “It can include virtually everything – virtually in both ways” that word is used. The VFH-sponsored Virginia Festival of the Book continues through Sunday, March 20, in and around Charlottesville. Publisher's note: This article was originally published on Examiner.com on March 17, 2011. The Examiner.com publishing platform was discontinued July 1, 2016, and its web site went dark on or about July 10, 2016. I am republishing this piece in an effort to preserve it and all my other contributions to Examiner.com since April 6, 2010. It is reposted here without most of the internal links that were in the original. On the evening of March 16, in the historic Dome Room of the Rotunda at the University of Virginia, Jim Leach, chairman of the National Endowment for the Humanities, addressed the topic of “Civility in a Fractured Society,” as part of the 17th annual Virginia Festival of the Book. After his formal remarks, Leach, a former Republican congressman from Iowa, spoke one-on-one with the Charlottesville Libertarian Examiner about civility in politics and the role of the humanities in American society. Those who feel “uncivil speech” is important, he continued, “have the effect of drowning out the ideas of others." Civility, therefore, “is designed to promote argumentation on the assumption that argumentation is important to society and that, if you don’t have good argumentation, there’s a tendency towards dogmatism (which means that people never can change their views) or towards tyranny (which means that people in public life can act with abandon),” Leach asserted. The National Endowment for the Humanities, which Leach heads, has cooperative agreements with 50 state humanities councils. “The state humanities councils have some of the finest community leaders in America,” who each year run over 50,000 programs, which are largely aimed at adult and civic education. They range “from poetry and literature to history and anthropology,” Leach noted. “They’re extraordinarily well-received programs,” he said, adding as an aside that “Virginia has one of the finest councils in the country” – referring to the Virginia Foundation for the Humanities, the sponsor of his speech at UVa, and calling it “one of the best led” of the state organizations. Asked about a recent report issued by the National Endowment for the Arts (NEA) that shows a decline in arts participation by so-called “omnivores” (people who enjoy aspects of high-brow, middle-brow, and low-brow cultural activities), Leach replied optimistically. “If you read literature, you put yourself in somebody else’s shoes. You learn from great figures in literature. You can learn lessons not to repeat from [those who] might be considered characters that you don’t identify with. “History provides a sense of where we’ve been and lessons that can be taken forward. NOTE: Video of Jim Leach's presentation at the 2011 Virginia Festival of the Book can be seen here: Part I (also above), Part II, Part III, and Part IV. My childhood, like those so many others, was the combination of George Lucas, Steven Spielberg, and, of course, John Williams. I would often sit, perhaps unhealthily, for hours at a time in front of a TV watching VHS tapes of dinosaurs eating people, a professor stealing holy artifacts, and lightsabers crashing. I absorbed it all, and my brothers and I practiced it. We would duel with our plastic (the old sturdy ones) lightsabers, hurting each other's’ fingers and feelings. Around high school, I had somewhat of a “nerd-retreat,” a time when being a fan of Star Wars was for some reason “uncool.” College reopened my love for the great saga, and now, I unashamedly utilize the galaxy far, far away in my classroom teaching economics and government. Every fandom has its gloriously diverse and vast fan-fiction with theories that range from the plausible to conspiracy. Star Wars, through the former Expanded Universe (dubbed “Legends”) and the official Canon, is ripe with opportunity for fans to write, speculate, and imagine. My three younger brothers and I constantly engage in this activity, debating the merits of Emperor Palpatine as the murderer of Padme Amidala and the like. But while all of this is fun and engaging, it seems to lack a certain gravity of importance. I asked this question a few weeks ago: if it lacks importance, why do so many love to think and talk about Star Wars? What brings millions to engage in such an activity? In order to understand this question, we need to understand the definition of a key word: mythos. A mythos is a common set of stories that can be used to explain the world, and more often provide a foundation for a cultural morality. A mythos is not the equivalent of religion. Religion tends to provide an explicit and prescriptive morality. A mythos provides more of a cornerstone worldview, a basic layer for others to build upon with morality. Any discussion of mythos has to include the renowned mythologist Joseph Campbell, whose seminal work The Hero with a Thousand Faces elaborated on what’s called the “hero’s journey.” Essentially, the hero’s journey is a basic story structure where a seemingly boring individual rises to become a hero with the aid of mentors and friends, and must brave great adventures and villains. Campbell identified the hero’s journey across all cultures. The same basic myth-narrative is repeated in nearly all geographies and ethnicities. The hero’s journey is, at heart, the common human story repeated everywhere. This monomyth, as it is called, has been studied and examined ever since Campbell’s work was published in 1949. It’s changed here and there, with different scholars adding different things, but it remains more or less the same. The monomyth can be clearly seen through the Star Wars saga, but it is especially clear in Episode IV: A New Hope. Luke, a seemingly unbecoming farm boy, is called to the adventure of saving a captured princess from black-cloaked villain, and initially refuses. With the help of a wizardly mentor and a band of equally unbecoming allies, he becomes entrapped in the belly of the beast (the Death Star), from which they escape with their reward (the Death Star plans), but not before Luke endures the pain of watching his mentor (old Ben Kenobi) die. The final trial, destroying the beast, is Luke’s great transformation from the boy on Tatooine to the next generation of warriors (the Jedi Knights). This is fascinating stuff, and very exciting. Not only was the 1977 cinematic experience great, but the entire saga’s story is wonderful, however much it may be masked by poor dialogue and acting. 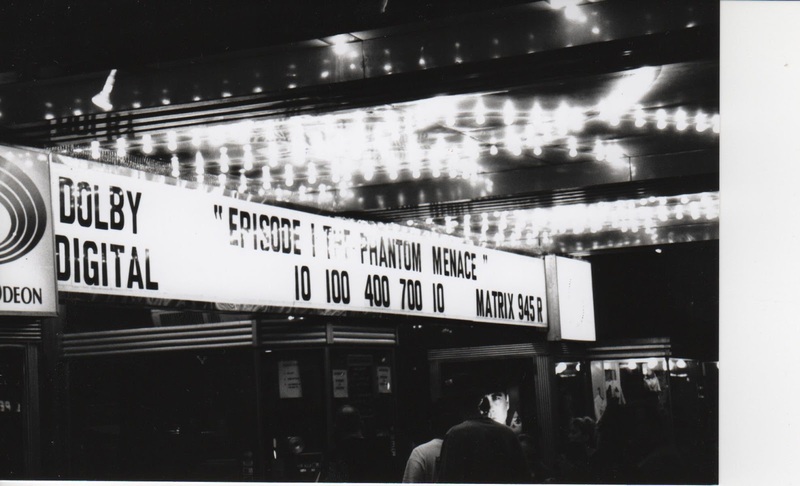 Film critics have never been a fan of the movies, even for their stories. They say it’s too easy, made for children, cartoonish, etc. I read that as, “This isn’t morally ambiguous, and therefore, it’s not a good story.” Such nihilism is apparently cool, but I don’t buy it. No, the stories aren’t all that complex, but that’s the point. Remember, a mythos is supposed to aid us in developing an understanding of the world from a certain point of view. Through stories, we lay a foundation to build an ethical code founded in morality. The purpose is to get us to think about how we act and why we act. If we get bogged down in Inception-class complexity, we lose that powerful purpose. The story in Star Wars is intentionally simple. The characters aren’t stereotypical, but archetypical, and resonate a certain set of traits we can easily identify. It can sometimes feel like a children’s story, but again, that’s the point. The essence of a mythos should make us wonder in awe, tap into our imagination, bring out our inner child. When I watch these movies, I’m like a giddy boy, relishing in the narrative. When the movie is done, it’s almost as if my inner child, having finished the adventure, returns and consults with my adult on what just happened. That’s mythos: the dialogue between wonder and reason. The master of this myth-creating process was J.R.R. Tolkien, author of Lord of the Rings and The Hobbit. He saw that England lacked a true mythos, one separated from reality (thus eliminating anything relating to King Arthur and Beowulf). He set out to create an entire universe he could populate with stories; thus was born Middle Earth. His goal wasn’t necessarily to write great stories (which he did), but to provide an epic universe with histories, a genesis (see: The Silmarillion), and languages with dialects. LOTR has a distinctly English feeling to it, one his countrymen could understand. He wrote it so others could think about the world in a certain way. Some of these stories, like The Hobbit, are so relatable they feel like a children’s story. Now, George Lucas is no Tolkien. He is a controversial creator, one who nearly destroyed his saga. His storylines can be disjointed, almost contradictory, and he can seem self-serving. Nevertheless, his universe is a fountain of myth, and one that resonates with millions of Americans. Why? America, at its core, is part of Western Civilization, and relies heavily upon its philosophy and religions. As such, it is greatly influenced by the moral idea that there exists objective good and evil. But we are also a multicultural nation, one that has accepted and welcomed many Eastern philosophies as well. As Americans, we are intrigued by the initially exotic beliefs of the East, and we find a certain tranquility in them. We are drawn toward the idea of a Buddhist monk devoid of personal possession and at peace with everything. We see his balance, and we desire it. Star Wars seeks to establish a clear dynamic between good and evil: the Rebel Alliance and the Galactic Empire, the Jedi and Sith, Luke Skywalker and Darth Vader. There is great conflict between these easily identified sides (I mean, for crying out loud, the lightsaber colors reveal it all). Yet, the theme of balance is always present. Luke literally balances Yoda on his foot upside down while balancing rocks. C’mon. The Chosen One was to bring balance to the Force, a Force which is at once an inanimate energy field made up of microorganisms, and yet also a personal, willing thing. Is this a contradiction? No, it’s the basis of a mythos worldview. Americans love a good cops and robbers story, the cowboys and Indians conflict. But we also seek a peaceful tranquility of balance. Star Wars gives us that battle, but simultaneously breathes of a harmonious spirituality. Destiny must be fulfilled in this universe, but personal choice never disappears. Americans, historically, believe they have a duty, a manifest destiny, in the world. But liberty is at our heart too, and we can choose to reject this perceived duty. We are drawn to Star Wars because it mimics what we feel in the first place. Why does this matter? I believe it is very important for great societies to have a basic cultural commonality. For America, we used to be fairly homogenous in our Protestant religion. That’s not the case anymore, and even when it was, there was no unified denomination. Religion doesn’t make the cut to act as our cultural unifier, and politics certainly doesn’t either. We need a myth, one with an acceptable starting point, a Square One. Star Wars is arguably one of the only viable mythos for America. It has such a wide arrangement of characters and messages that different people can gain different things from it. It embraces our Western-Eastern dichotomy, and, quite frankly, it’s pure fun. We need Star Wars not because it is a masterfully created cinematic experience, has great dialogue, or anything like that. We need it because the story, much like the Force itself, can surround and bind us together. A version of this article first appeared at the Catholic Beer Club. Stanton Skerjanec is an economics and government instructor at Liberty Common High School, a classic liberal arts charter school in Fort Collins, CO.